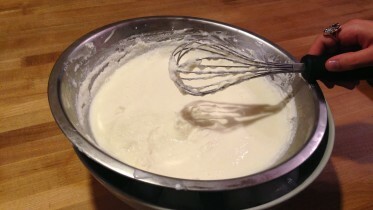 In the last post, we showed you how to make a dang good approximation of prairie ice cream, which was delicious! Trouble is, after we were done, we noticed that the kids had created quite a mess. Time for a load of laundry!! As luck would have it, however, we’d run out of laundry soap and no one had mentioned it to me. So, I had to make laundry soap before I ‘got’ to do that load of laundry! Yay, me! It’s actually pretty easy and doesn’t take a lot of time. And I make sure to have the basic fixin’s to make up a batch of laundry detergent on hand at all times. 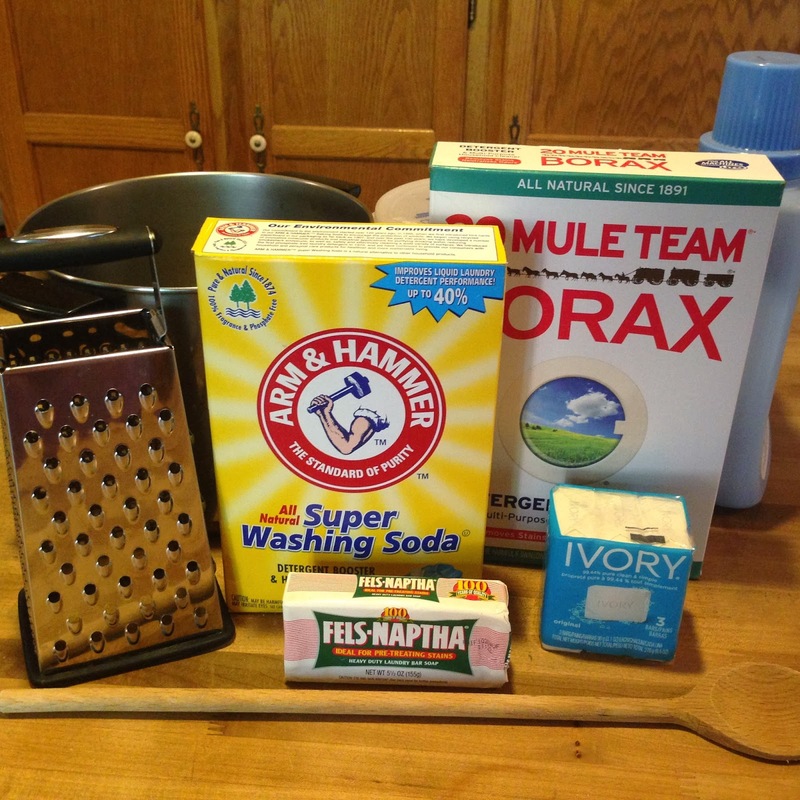 It’s not only quick and easy, but it’s downright cheap to make, too, and, most importantly, the result is a laundry soap that’s effective, tough on stains and good for all washing machines (including front loaders, low water, HE, and low-suds machines). An aside. . .I read somewhere once that we are trained to think that lots of suds means good cleaning, but that isn’t actually true. Suds are often added just to make the soap look like it working, but are actually not doing the actual cleaning! Interesting, huh? And when I mean home made laundry soap is cheap, I mean it’s ridiculously inexpensive compared to the bought brands. At only a few pennies per load, you’re probably going to be hooked, like I am! Washing Soda: Washing soda is sodium carbonate or soda ash (not to be confused with baking soda, which is sodium bicarbonate). It’s a laundry aid that helps remove dirt and orders. 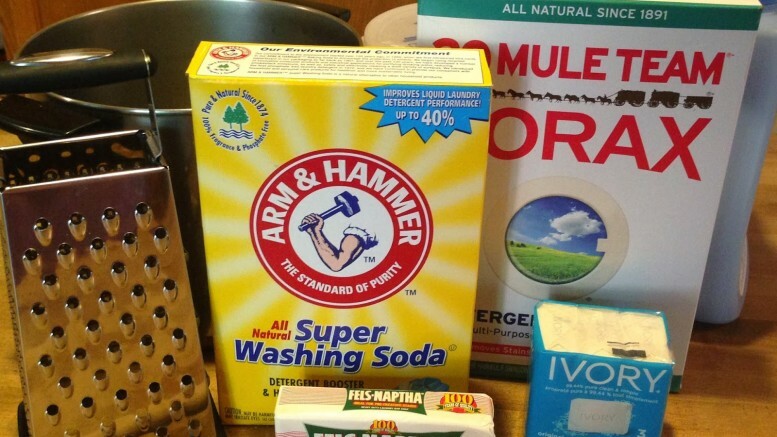 Arm & Hammer is the most visible/popular brand of Washing Soda and is also found with laundry items. I haven’t ever had a problem finding it, even in smaller grocery stores, but, if you do, it’s easy to find online. You can even make your own, though that’s another post! Borax: Borax is Sodium Borate, which is a naturally occurring mineral. It helps to whiten and deodorize laundry. (VERY helpful with mucky boys and mountain dirt!) A popular brand is 20 Mule Team. It’s also found with the laundry detergents or can be bought online. Amazing what stuff you’ve looked past all these years, huh?! Grate the soap on the fine side of a standard cheese grater so that it’s as close to powder as you can get it. Crumble up with your hands a bit, too, to break it up further. Add it to a half gallon of water (in the stock pot, of course!) and heat on medium until it melts, stirring as you go. The finer you grate the soap, the quicker this bit will be! While still on the heat, add the washing soda and the borax to the soap mixture, along with another half gallon of water and continue tostir until it is dissolved. When everything is melted and dissolved, remove the pot from the heat. Add the remaining gallon of water to the pot and keep stirring until it is well mixed and starting to cool. You don’t want to put boiling hot liquid into a plastic jug! Using a funnel, you can then transfer the soap to clean 2 liter bottles, or gallon ice cream buckets, the recommended gallon jugs or anything else you have that has a good, tight lid. Jugs or Bottles work great, because you can easily shake the soap up before you use it, which is sometimes necessary if it starts to separate a little. After about 24 hours, the laundry detergent will have gelled, but may still be slightly watery. That’s okay. If it completely separates into hard clumps and water, it probably wasn’t fully melted and mixed to begin with. Just pop it all back in the stock pot and heat/melt again. Once it’s gelled, it’s ready to go. It’s pretty concentrated stuff so I use about ¼ cup per load for regular loads and slight more for heavier ones. If you prefer your soap more liquidy, just double the water at each stage and use ½ cup per load. 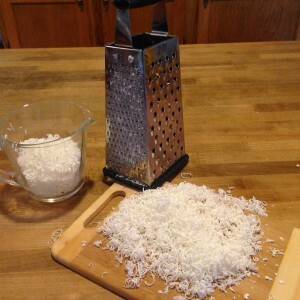 Note: If you prefer a dry soap, you can just mix the ingredients (making sure the soap is VERY FINELY GRATED! I would even use a coffee grinder or good food processor to get it as close to powder as possible) and store in a sealed plastic container of some kind or a coffee can. You only need 1-2 tablespoons per load, but, with this method, you will need to use warm or hot water with each wash to insure the soap melts and will actually clean your clothes. Another note: Because water is so different in different parts of the country, you’ll need to figure out what your perfect amount is. For me, ¼ cup of the concentrate or 2 tablespoons of the dry is perfect, but if you have harder or softer water, you may have to increase or decrease the amount slightly. Play with it until you’re happy! And that’s it! You will have loads of soap, that actually works well, for a fraction of the cost of store bought. Awesome, right?! I think that calls for some ice cream! 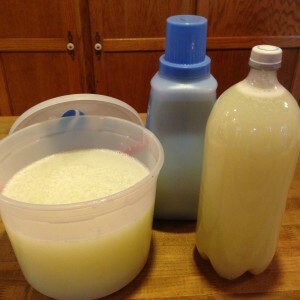 Be the first to comment on "Home Made Laundry Detergent / Soap"